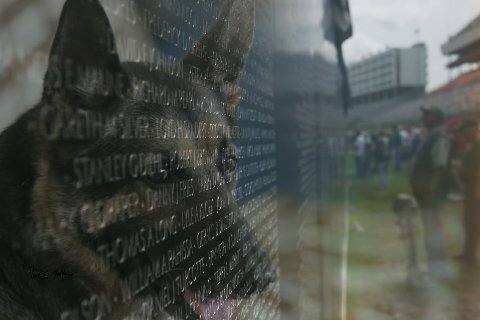 EARLY IN MY TRAVELS WITH BUCK, WE OFTEN VISITED BEAUTIFUL VETERANS MEMORIAL PARK in COLUMBIA, SC THINKING.... ONE DAY WE WILL HAVE A WAR DOG MONUMENT HERE. Artist Renee Bemis Has Captured the Heartbeat of the K9 Alert.....The Dog Handler and German Shepherd on Point in Phase 1 Phase 1 - Larger Than Life Bronze Sculpture of Dog Handler and German Shepherd on Beautifully Designed Granite Base by Memorial Park Architect Allen Marshall. Columbia Based, Bruns Monument Co., Contracted for Granite Work in Phase 1. Phase 2 Will be the Addition of Larger Than Life Bronze Sculptures: Labrador Retriever, Doberman Pinscher, and the Belgian Malinois, Representing the Four Primary Breeds of Military Working Dogs Serving Our Nation Since WWII. Total budget for the SC WD Monument is estimated at around $130,000.00 for the sculpture and plaza construction. We have raised $90,000.00 and need your support as we are quickly approaching dedication in November 2015. The statue is cast and will be assembled starting in April and delivery expected in September. 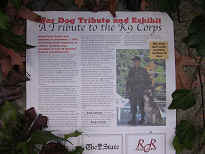 The SC Veterans Memorial Park "War Dog Memorial Fund"
Honoring K9s WWII to Present HELP US BUILD IT!